The great empire of the Incas at its height encompassed an area of western South America comparable in size to the Roman Empire in Europe. Click the figure below to see the interactive mind map of 'The Incas'. When Europeans first entered the Andean area in the early part of the sixteenth century, they encountered the Inca Empire, a vast and powerful political domain that incorporated the largest area in South America ever to have been brought under one ruler. Click the figure below to see the interactive mind map of the Ceramics of Ancient Peru. Click the figure below to see the interactive illustration of Chankillo, San Rafael District, Peru and Golden Rectangles. Fortified Temple of Chankillo and Golden Rectangles. Quechua is a Native American language family spoken primarily in the Andes of South America, derived from an original common ancestor language, Proto-Quechua. The official language of the Inca empire was Quechua. 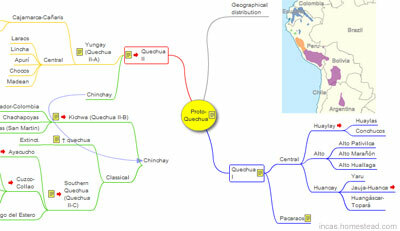 Click the figure below to see the interactive mind map of the Proto-Quechua. The official language of the Inca empire was Quechua.